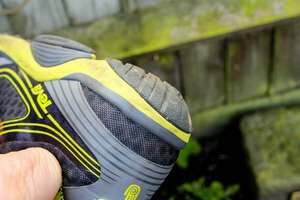 2) A revolutionary ball shaped heel which is designed to ensure you don’t ‘heel strike’ as you run, thus saving your knees from taking a hammering. The stabiliser ‘wings’ are designed specifically with the quirks of trail running in mind. Trail running, by its very nature, involves running over uneven surfaces and the tackling of potentially destabilising rocks and other objects. The company note that “Some people avoid obstacles, while others prefer to go right though them”. Therefore the wings ensure that the runner has full stability as they trail run, avoiding over or under pronation of the ankle or knee. Essentially what these wings do is extend the width of your foot, providing a significantly larger surface area on which to land your foot. This effectively evens out the surface to reduce the injury risk for the runner. Turning an ankle or twisting a knee has ended many a trail runners run, so these extend beyond a simple marketing gimmick. The rounded heel is a design feature intended to avoid the dreaded runner’s heel strike. This is a design feature intended to rectify any problems with your running stride through the technology. This running technology approach is different to say barefoot running shoes, because these are intended to help you to fix your stride in order to rectify the problem. Two ways to kill the problem and the best solution for you will depend on the extent to which you heel strike and they type of running you do. This is intended to add power to your stride as well, as heel strikes usually kill the energy in your stride as your knees absorb it. By capturing this energy, the shoes allow you to run quicker and beat your personal bests. These shoes do follow some of the zero-drop running shoes philosophy by lowering your heel closer to the ground. This adds to the stability offered by the wings. Where the Teva Tevasphere Trail eVent’s are different to the zero drops and barefoot is the weight of them, as the technology adds bulk. 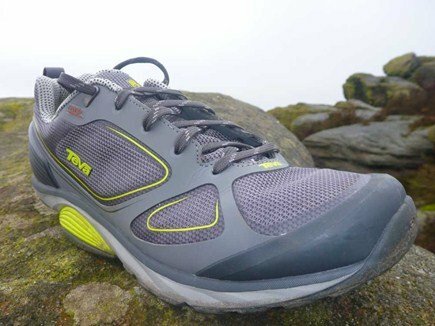 Finally, Teva have incorporated their famous dry fit technology, which utilises a breathable membrane in order to keep you dry on your trail run. 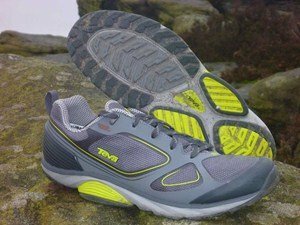 So what can we conclude about the Tevasphere Trail eVent shoes? They’re technologically advanced and well adapted for the specific needs of trail runs. If you aren’t a trail runner, then there are much better running shoes on the market for your needs in my opinion. In their correct environment, out on a trial, the eVent’s perform well. The wings are effective in making your foot wider, and they do definitely seem to reduce the chances of twisting an ankle or knee. I didn’t find huge value in the rounded heel, but I have trained myself not to heel strike and as such this is a surplus feature for me. For those who are interested, the Tevasphere Trail eVent is available now, exclusively at Cotswold Outdoors in the UK. Next articleWill Google Glass take off or fail and become the Segway Mk II?